Thursday night or more like Friday morning, between the hours of 1:30 and 3:30AM J was up playing in his crib. Really playing. I got up because I heard him, and I looked in the monitor to see him playing with all his stuffed animals. It was so cute. I went back to sleep. ha! The reason I am pretty sure he played the whole time is I woke up hearing him talking around 2:30, and I finally got up to check on him around 3:30, change his diaper and see if he wanted some milk. After the diaper change and some milk, he was sound asleep. My little man wore himself out playing in the middle of the night and slept in until 9:40AM! Crazy! I loved it! My parents are in town for a few days so I woke up a little earlier than Jacob and got some time with my parents before their sweet little grandson woke up! J was so much fun all day Friday. At lunchtime he saw me eating potato chips. I have never given him a chip before, and he acted like he wanted one. I wasn’t planning on giving him one, but he threw one of his toys (yes, I allow him to have 1-2 toys at the highchair, it keeps things interesting and more importantly, keeps the fit throwing down). The toy hit my plate and a chip broke and bounced right on to the highchair in front of J! In goes the potato chip! He had the biggest smile!! Insert here the love potato chips, or at least the love of salt. lol I love my little boy! For Father’s Day I gave my sweetie an ITunes gift card (which he has probably already spent on some tunes!) and a picture frame with a picture of him and J from last year’s Father’s Day. After we came home from church baby J and Chase took a nap. At around 4pm (3 hours of a nap later), we decided to be spontaneous, which doesn’t happen much with us anymore. We went to the lake for about an hour to wrap up Chase’s awesome Father’s Day! 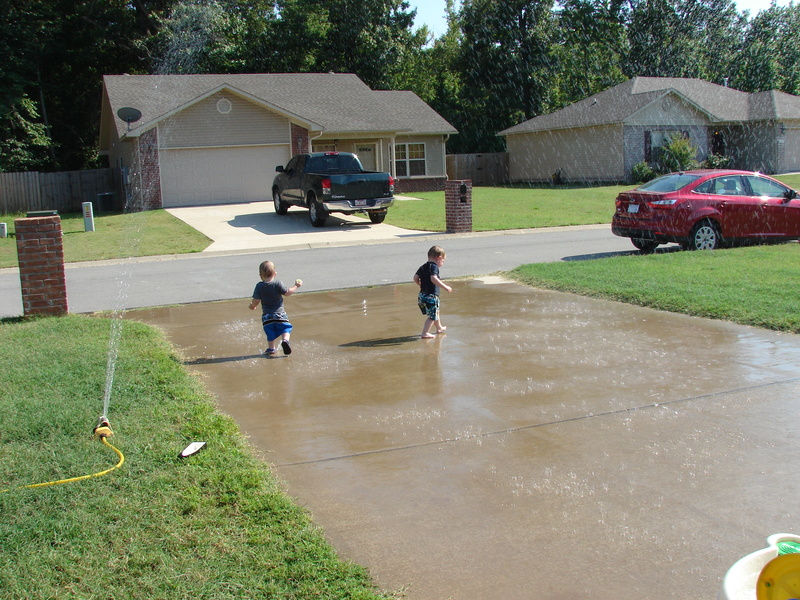 We really had a lot of fun relaxing, being together, and swimming a little this past Sunday. On Saturday we had a friend over who has a 2-year-old little boy. 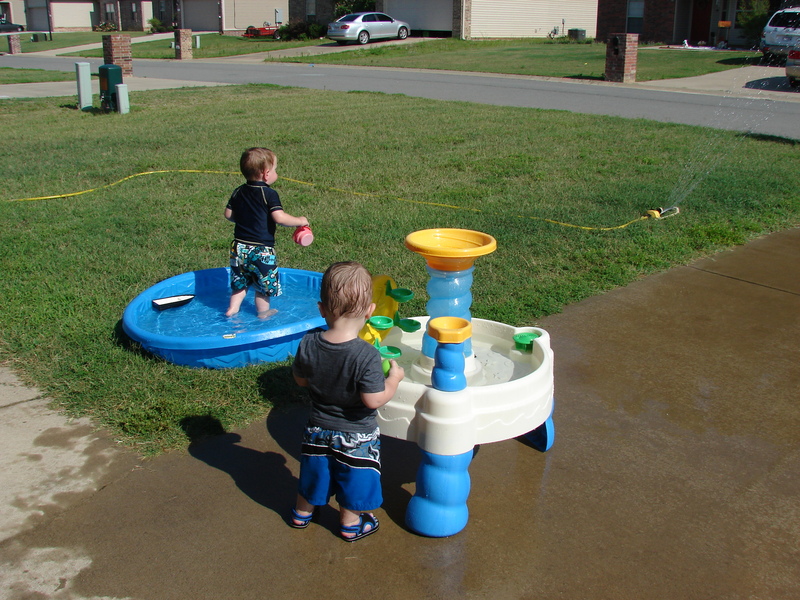 We set up the sprinklers, kiddie pool, and water play table outside for them to play with and they had a blast! Before I ever became a mom I started taking mental notes from friends and relatives who had babies before me. I had a mental list of things I knew I should do, shouldn’t do, should try, and things I should never attempt as a mommy. So, I pretty much thought I somewhat had the big picture figured out. I came to realize, pretty much right away, as soon as we entered our house with a baby, that I only had the outline of the big picture sort of figured out. It will take many years and a lot of learning until the picture is finally drawn and colored in. And I have a pretty good feeling my picture will be something abstract with a lot of colors. Everyone’s picture is different. Every child’s picture is different! I used to have these set of thoughts like “oh routines are good! All children should be on a routine! It works!” “Oh, no candy before the first birthday sounds like a great and wise idea! This will ensure healthy eating!” lol And on and on. You can only imagine. And if you are a mom, I am sure you had similar ideas. Now that I have been a mom for just over a year I can look back and laugh. 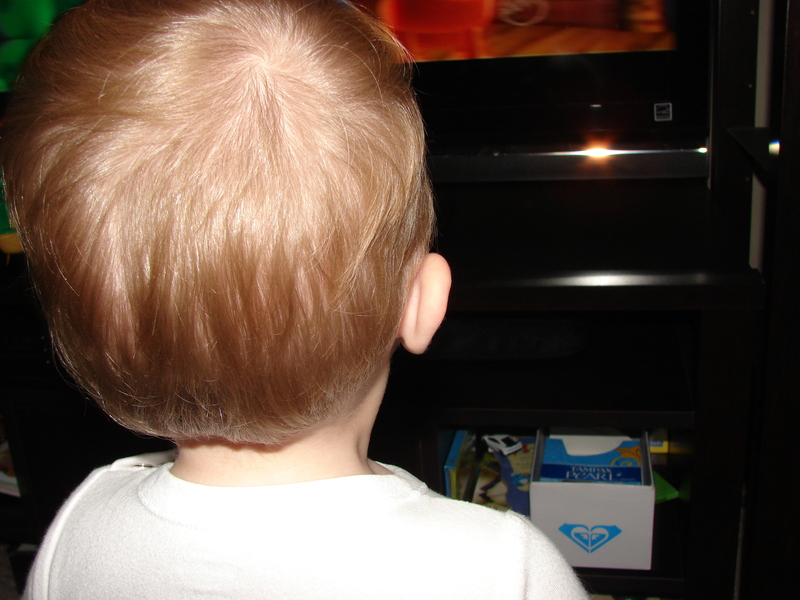 Yes, a routine works well for my kid, but maybe not for yours. Candy? My child doesn’t even LIKE it. He still doesn’t want to eat any, but it had nothing to do with waiting until he was a year old. I think I gave him a tiny piece of chocolate many, many months ago and was so disappointed he didn’t like my all time favorite food. Ha! He is just like his daddy and prefers salty and savory foods. So go ahead and give your baby some ice cream, really… I won’t judge. In fact, because each family is so different, and each mom, dad, and CHILD are so different, I realize that each family does what is right for them. I could go on and on, but instead I would love it if you would head over to Mama Birth’s blog and read what she has to say. Her post was so good and right on. On Saturday morning we took baby J to get his first haircut. We went to a place that specifically caters toward children and has toys in the waiting area, airplanes and cars for seats, and movies playing. Baby J loved the toy train, and that is where the love ended. We had three things against us already before we even walked in. Baby J does not like to sit high up unless he is in our lap (he recently got the whole “height” thing and now he just isn’t sure about being high up unless he thinks he has total control of the situation), he doesn’t like to be strapped into a seat (but he usually gets over it), and he really does not like me brushing his hair. Once we got home J crashed for a long nap and this momma went to her bedroom for a cry herself. 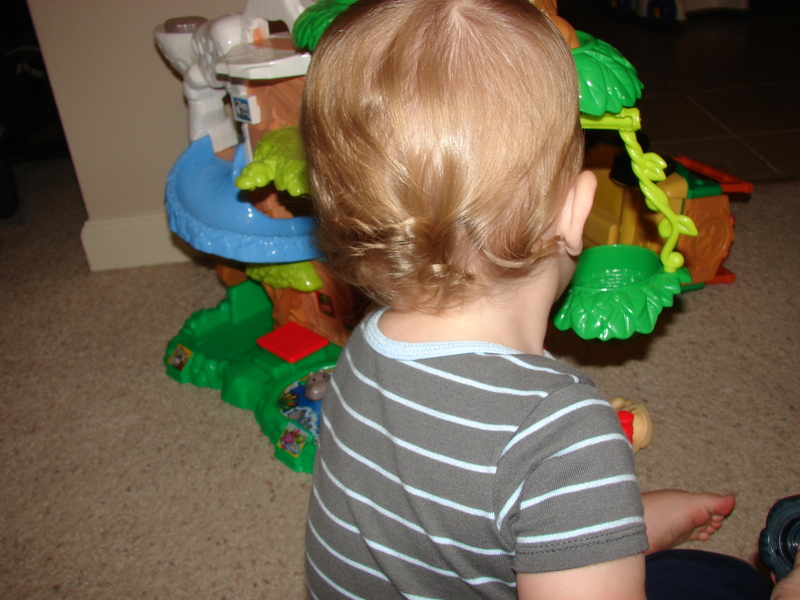 My baby J lost his curls in a traumatic hair cut session. I may not be so against the whole growing the hair out for a while thing. I mean, you never know, 50/50 chance those cute curls may come back. Baby J is now 15 months old! I can barely believe it! Here is an update on my little man. I’m sure there is more, but that is all I can think of at the moment. He just recently had an outburst of words, and he is trying out a bunch of new ones! He knows tons of words now. He usually understands what I am telling him when I talk to him. He is quite the character. He may not let me put food in his mouth, but when I say “Could you please try some?”, he usually opens his mouth. Hoping this lasts.. He throws some pretty good fits now too when he doesn’t get his way. Two of his standard fits are either laying on the ground kicking his feet or standing up and stomping his feet. Both involve some sort of squeal/cry. I always ignore his fits and he usually stops right away. Baby J plays hard. He really gets into playing and just loves it. He pushes his cars across the room and kicks and throws the balls around. He really likes to have someone he can toss or kick the ball back and forth to. He isn’t that great at this yet, but you can tell he gets the concept. He still loves putting things in an object and taking them out (like his toy box), and he loves playing outside! We are having a lot of fun with our sweet little man!! 15 months! It’s hard to believe.